This paper explores the study results conducted in the framework of a LLP-European project on the field of university modernization that carried out a survey amongst leading European universities in Science and Technology. The focus of the study was to better understand how strategy is developed within these universities, which tools are mostly used and how the strategic management processes are organized and implemented. The paper is framed to analyze the fundamental questions being examined: how is the strategy definition process in these universities like; what tools and models of strategy development and monitoring are used; how they assure that strategies are implemented and aligned; what supporting instruments are at place and how do universities establish the feedback mechanisms of the strategy development and ensure organizational learning from this process. The paper explores these central questions and sets forth a comprehensive discussion on the main practices trends and perspectives. This paper explores the study results conducted in the framework of a LLP-European project on the field of university modernization that carried out a survey amongst leading European universities in Science and Technology. The focus of the study was to better understand how strategy is developed within these universities, which tools are mostly used and how the strategic management processes are organized and implemented. The paper is framed to analyze the fundamental questions being examined: how is the strategy definition process in these universities like; what tools and models of strategy development and monitoring are used; how they assure that strategies are implemented and aligned; what supporting instruments are at place and how do universities establish the feedback mechanisms of the strategy development and ensure organizational learning from this process. The paper explores these central questions and sets forth a comprehensive discussion on the main practices trends and perspectives. Girotto, M.; Llinas-Audet, Xavier. 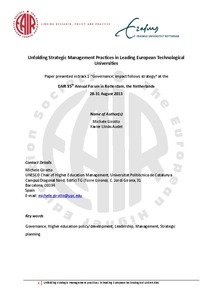 Unfolding strategic management practices in leading European technological Universities. A: The European Higher Education Society. "EAIR 35th Annual Forum 2013". Rotherdam: 2013.